I awakened on Michael's glassed-in porch to a dreary, drizzly morning. I thanked him and bade him goodbye, then clomped around Chapel Hill's UNC off-campus student zone for a while. It's pretty, bricky, with access to espresso-based drinks reassuringly never more than three storefronts away. This is what you might get if you passed Cambridge or Berkeley through an autoclave. The rain quickened during the drive west, frequent downpours challenging the Camry, its windshield wipers two years past the mandatory replacement stage, during its valiant upward climb into the Great Smokies. Just as we wheezed to the ridge line, the rain suddenly stopped and the sky brightened to reveal a broad valley below, with a few dissipating black clouds banging against the sides of the peaks in the distance. It was a breathtaking sight, one that forcefully reminded me why I do these crazy things. On the far slope, the twisting descent into Tennessee through blossoming dogwood and mountain laurel, though spectacular in its own right, was almost anticlimactic. Knoxville was bathed in full afternoon sun. 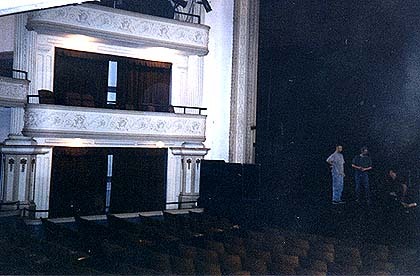 Downtown, the Bijou Theater is a beautifully restored relic of the vaudeville era that miraculously escaped the wrecking ball. Knoxville has a small but vibrant music scene, overshadowed by the excesses of Nashville, its neighbor to the west. The Bijou crew kept everyone laughing with an endless supply of local-color anecdotes and dead-on, wiseass observations about life, love and the human condition. Just fine people. The audience for Bob's show was polite and attentive, the somewhat formal setting not conducive to wild surges of audience enthusiasm. Bob responded with a workmanlike performance. Nobody went home disappointed.